A couple of weeks ago my husband Danny and I drove up to the Mount Grays and Torreys trailhead. My SUV wound up the steep dirt road so slow a granny with a walker could have passed us at times. While struggling over rocks and pot holes in the comfort of my Toyota Highlander, I thought of the hope and courage miners carried in their hearts while traveling up this same treacherous road more than a century ago. We came upon a miner’s boarding house. Situated along a stream and within view of Mt. Torreys, it appeared ready to tip over. When placing my hand on the weathered boards to take a few photographs, I expected it to lean with me. Cavernous holes spread across the floor revealed the black void of a crawl space or cellar. I didn’t dare enter. If we camped nearby, would we be awakened in the night by the ghost of one of those hopeful souls? We may have stepped on their graves while investigating the dilapidated ruin. They’re still discovering the remains of pioneers in Breckenridge. They buried the dead where they died until the town built a cemetery. Then they moved many of the bodies and wooden caskets buried throughout the town to their final resting place. Human bones are often found when excavating for a new building. It’s a common occurrence. 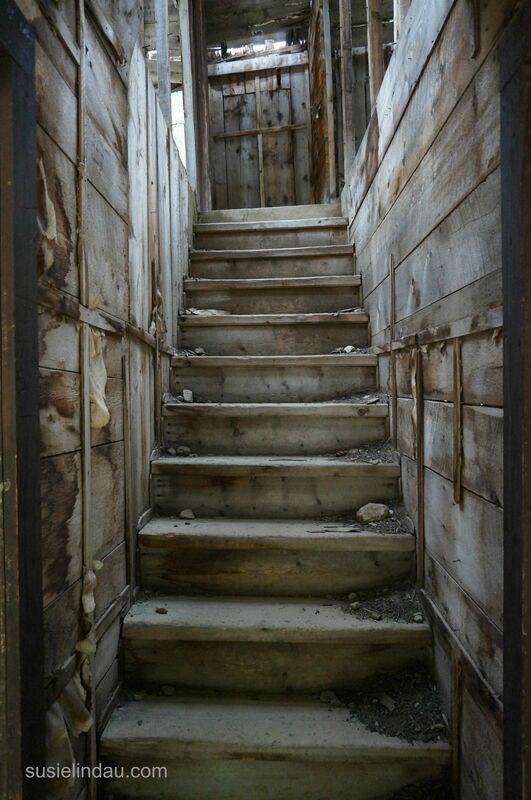 When walking around the remains of the two-story building, I was thrown back in time. I imagined the scent of griddle cakes, bacon and coffee lingering in the thin mountain air. I cast a glance upward to the second floor where a few miners slept in their austere rooms after a night filled with tall tales and whiskey shots. A tenant sitting on a three-legged stool played the fiddle, while another played harmonica. Several men sat on the porch and clapped while another read from a well-worn book of poems. Still another sketched. Maybe they employed a few prostitutes who traveled from Breckenridge’s Red Light District to strike out on their own. Horse-drawn wagons filled with supplies would interrupt the entertainment. Letters would be delivered and sent. After their day of rest some would head back to the stream to pan for gold while others would lead their donkeys to placer mines always with hope in their hearts. What happened to the people who filled this establishment? Do their descendants know anything about them? A light breeze tumbled down the mountain and dragged a fingernail up my spine playing my backbone like piano keys. The aspen leaves trembled. The whisper of the stream told stories of miners whose bones had been buried long ago. It was time to go. For another real ghost story read Haunted at the Stanley Hotel. I didn’t dare step inside. The whole building might have toppled. There were people camping nearby. I would think it would be really eerie at night, so I have to go back…Thanks Guat! What can I say, Susie? This is a great take on the challenge, Susie. 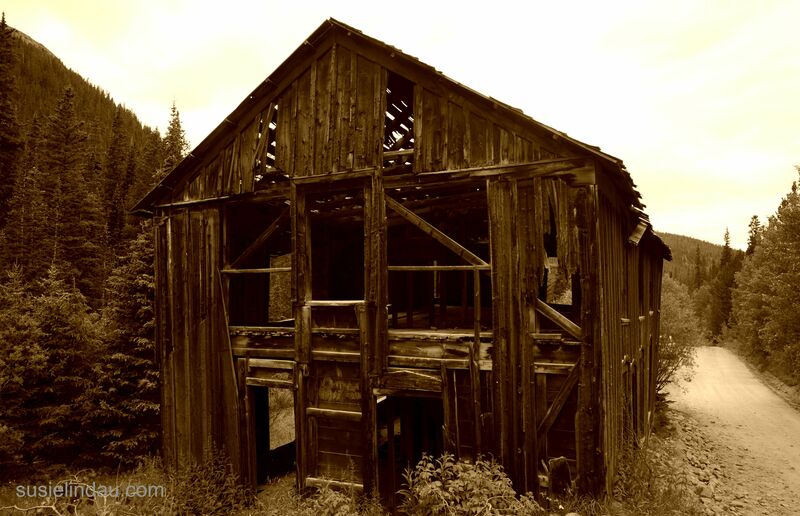 Like you, I find myself wondering about those miners and their lives when we encounter the ghost towns here in Colorado while chugging along those mining roads in our Jeep. It must have been and incredibly difficult life. Fabulous shots! Those steps look creepy as hell to me!